Many-flowered Puccoon grows in meadows and open woods in the foothills and mountains. 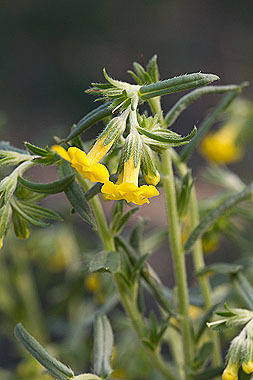 Yellow flowers have tubular throats and the edges of the petals are entire (without teeth). Leaves are narrow. Plants are 10 to 20 inches tall. Compare to Lithospermum incisum (Narrowleaf Puccoon). Narrowleaf Puccoon has fringed edges on the petals and a narrower opening at the top of the throat.